The code is built in a modular style to allow a user to find ways to modify project. In start the D Lock programs loads with a default code of "2345" format is *2345# which can be enter to unlock the door, the code cam be change by entering the master code in the format *23455#new 4 digit code. 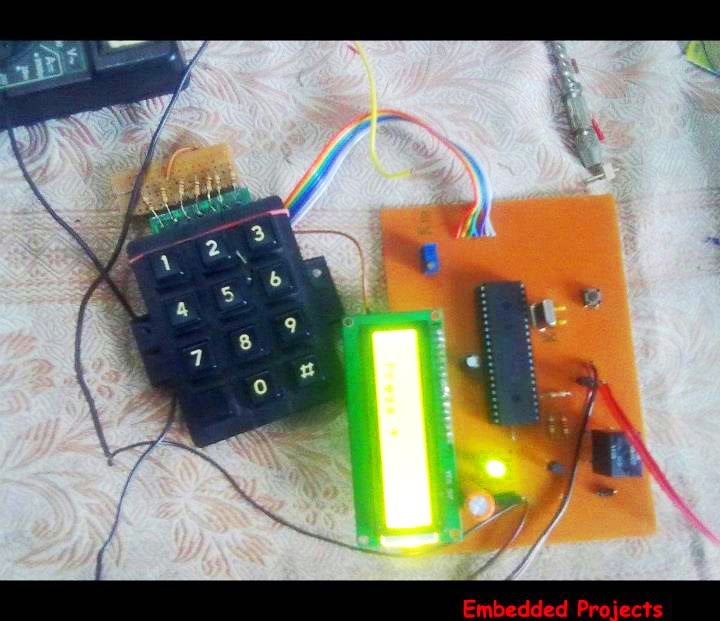 In this program I display only the result on LCD and lock will be connected to PORTA bit 0 where I put led for simulation. While unlocking, if the entered password from keypad matches with the stored password, then the lock opens and a message is displayed on LCD. Also an output pin is made high to be used for further purpose. Password should not be displayed on LCD. It is not secured. **** can be displayed instead. Thank you foe your advise. This project is designed as an academic project. Simplicity is for the ease of demonstration. And added a buzzer and some more features to it. If anybody enter wrong password more than three times, the buzzer sounds continuously and system should be restarted. Its working no problem. I will send the whole project in proteus. You should use pull downs for all pins connected to keypad in a real design. really interested to kjnow the deatails of this project..so pls send me here..
but i need this programs in Mikrobasic can you get it for me?? is the code given full complete..? THANK YOU FOR THIS SUCH A GOOD COMPILATION OF PROJECTS. CAN YOU MAIL ME. THIS PROJECT CODING ON NOTEPAD. THANK YOU FOR YOUR QUICK REPLY. IF I WANT TO USE 4X4 KEYPAD WHAT CHANGES ARE EXPECTED. connect the 4th column to 4th(1,2,3,4) pin of the keypad port, and make required change in program. i am having a problem while compiling this code at mikroc version 8.2. it is giving an error char keypadPort at PORTD; on this line. i really want to compile it and need its hex file. I have tried your code many times to compile. please help me why it is not compiling my compiler is working fine. Make sure that you included the keypad library. Please tell me the library file for keypad.. and what more header files are to be included. You can see Library Manager tab left of the project window. Check the check box of required libraries. GREETINGS MY PROBLEM REGARDING ITS SIMULATION IS SOLVED THANKS FOR YOUR HELP. NOW SOME THING WHICH IS NOT SUPPOSED TO BE OCCURRED IS BEING OCCURRED. WHEN THE SIMULATION STARTS THE LED AT PORT A pin 0 starts glowing but instead it should glow when ACCESS is being granted. before it must not glow. If am right then please provide appropriate solution. else guide me what is the real logic behind it. Sorry the file is missing, i will try to build a new one. Sorry for late reply. sir can you also send me the proteus file? No problem in the code for taking random character, it works perfectly. Is that taking randomly always? check the keypad connection. the connections in come of the available keypads are not in order, check our keypad tutorial here. Its code protected for THREE wrong entry, after that the device cannot be accessed, you need to reset it. All of you are welcome to our group, get the link from the above blog post. Please, can you mail me the pdf of the project, and if you do...would it be ok if I modify it while practicing? "Microcontroller based electronic locking system module"
...and I'm not really sure how to go about it....can you help. I had written only this much of matter, so there is no PDF available. I hope the above explanation is enough. There is no problem for using the code or design, but if you post this project somewhere please add a reference. Use the Discussion Group link please. 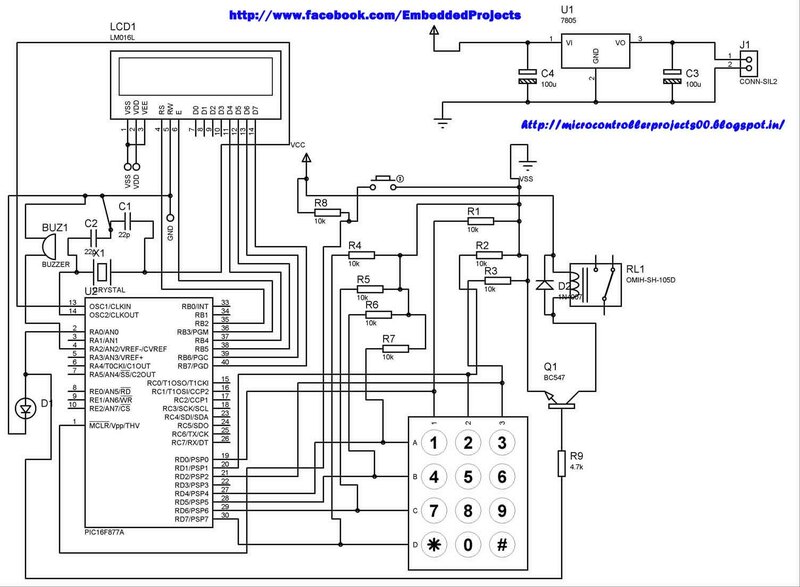 what does the circuit U1 do thats on top right if the figure..
please send the project code in notepad and proteus file. thank you. I already chosen this project as my school final project. Please send me this source in C (.txt) , other .pdf files and useful references links to my mail: paing.peace@gmail.com. There is a link posted at the end of the article, you can download HEX file and C file (From Facebook Group). Sir, i can't download from http://www.scribd.com/doc/86640317/Electronic-Code-lock. i cannot purchase thus also cannot download because of our country. Can't do copy/paste. But i read and typed in Notepad and complied in mikroC Pro. when write, occur 4 data error. So please send me Source Code in C with Notepad. i downloaded HEX file from FB Group. sir im really cant access the facebook link...can u send the source code to my emaIl (sunkgacrewz22@gmail.com) asap..please sir..im doing this project for my final year. hOpe u will help me. Does it work well? Could it surely secure anyone's home? necesary?Those who have worked with this circuit please help me. That's an awesome concept with microcontrollers. Security system is very essential in each and every technology nowadays. Password must be complex and should not be in an easy way to analyse by anyone. 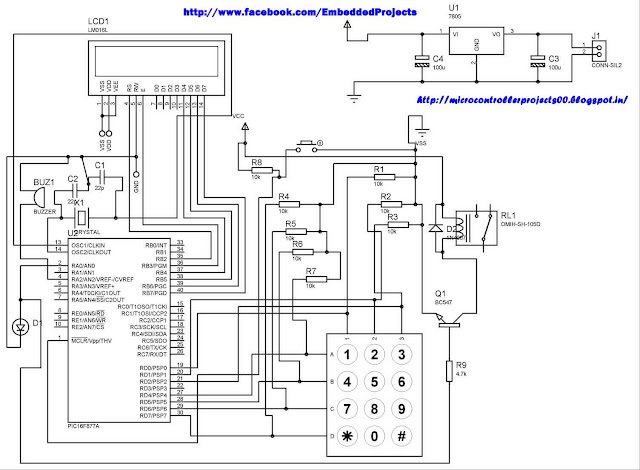 PIC microcontroller is used to perform various kinds of tasks which is used control a production line and microcontrollers are programmed as timers. It is used in control systems such as door lock mentioned in the blog, alarm system, phones,etc. Check for FF in the program. I can identify it if you paste the code snippet here. Hi sir, i,ve been working on this project since last four days. I'm using AVRatmega8 as the microcontroller...if you could send the code of complete project along with the buzzer functionality..and other relevant details that will be helpful. Thanx a ton in advance. Wow...... all are so technical part.... is it for Door Lock Access Control?? Hello Sir Vishal! I am a student and currently working on my thesis project. I saw this project and downloaded the code and also imitated the circuit you provided because I wanted to make it as a reference while I'm developing our project. Unfortunately, when I started to test it in proteus (I imitated the circuit you uploaded), and tried to enter to password (*2345#) nothing happens anymore ... Right now, I still trying to figure out & troubleshoot the circuit and understand the code at the same time. I'm really hoping that I could get in touch with you for further information and advise. I will greatly appreciate it. I am also asking if you can send me the original proteus file and code (if available) you made so that I could study it further. Here is my email address, Sir: shinnacuray0929@gmail.com Thanks and More Power! I have edited the post with source download link, check it. Digital Lock from our scope connected with Door Electronic Lock Security house singapore items for your near by Bunnings property Singapore. i need keypad and relay. can i use 16F628A or such as PIC. Shard Global Ltd offers IP Camera Installation in UK and intelligent security solutions that enable a smarter, safer world. As the global market leader in network video, Axis is driving the industry by continually launching innovative network products based on an open platform - delivering high value to customers through a global partner network. With UK Phone Systems, you get the most advanced and fully featured phone system in the industry. It is a system that is ultra-reliable and supported by a highly trained staff located right here in the UK, a system that will save you money and enable you to focus on your business. Thank you for such great code.I thought I knew how to make a 4x3 keypad project until I started.....I had no idea how to display more than one keystroke at a time! I truly appreciate for your efforts you to put in this article, this is educational and helpful. I truly enjoyed in reading this blog. Continue sharing and give us updates.